With the rising level of accidents in Kozhikode city in Kerala, Police is taking proactive steps to alert the road users. The city cops have identified over 50 ‘death spots’ on the city roads which are prone to accidents in the North traffic division alone. The city alone deaths of 185 persons in 2017 due to road accidents, which is quite high. 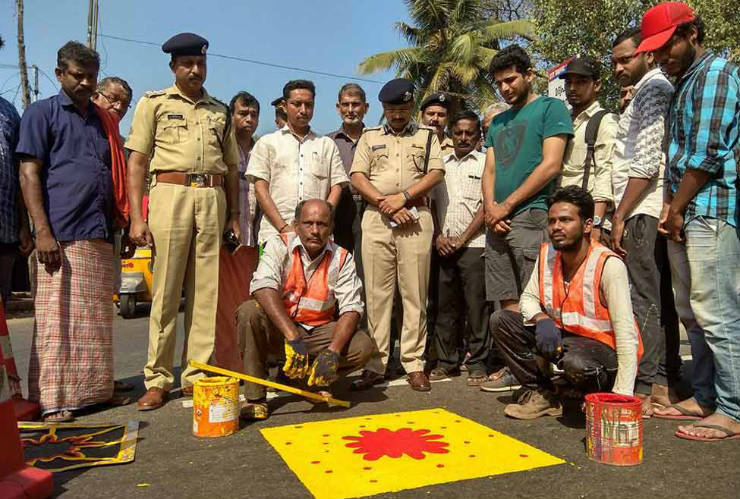 Police are painting the roads with bright yellow marks that will alert the road users. All major city roads have been marked with signs including Kannur and Wayanad roads. The officials say that the marking of such spots was completed by the end of the 2017 and there has been fall in the number of accidents since then. The city police have also approached National Transportation Planning and Research Centre (NTPRC) to change the alignment of roads at the accident-prone spots to further reduce the possibility of accidents. The cops say that nearly 100 locations will be identified to improve the public awareness about such spots. Cops are also taking the help of social media to spread awareness about such spots. A police officer says that the spots have been marked primarily as a cautionary note to the young motorcycle riders who use the public roads for dangerous stunting and reckless riding. According to the latest record from the city, the motorbike riders are the most vulnerable people in such spots. According to the District Crime Records Bureau, out of the total deaths in the Kozhikode city alone, as many as 81 victims were on bikes who were knocked by other cars or sustained head injuries. 27 pillion riders and 53 pedestrians are also among the high number fatal accidents.